But someone will say, “You have faith and I have works.” Show me your faith apart from your works, and I will show you my faith by my works. You believe that God is one; you do well. Even the demons believe—and shudder! Do you want to be shown, you foolish person, that faith apart from works is useless? Was not Abraham our father justified by works when he offered up his son Isaac on the altar? You see that faith was active along with his works, and faith was completed by his works; and the Scripture was fulfilled that says, “Abraham believed God, and it was counted to him as righteousness”—and he was called a friend of God. You see that a person is justified by works and not by faith alone. And in the same way was not also Rahab the prostitute justified by works when she received the messengers and sent them out by another way? For as the body apart from the spirit is dead, so also faith apart from works is dead (James 2:14-26). In that last paragraph we find the confusion of Adventism’s teaching. They are careful, officially, to insist that no one is saved by works. Nevertheless, specific Adventist works are required, and the particular requirements are revealed near the end of the Teachers Notes. Adventists must keep the Sabbath and must follow the “health message”, especially the abstinence from unclean meat, and drinks containing caffeine or alcohol. In fact, the paradox is complete at this point; Adventists will insist they do not have to keep the Sabbath (or abstain from pork or beer) in order to be saved, but they do believe that if they give up the Sabbath, or if they abandon the health message, they will be lost. This contradictory belief is a logical fallacy. If one cannot be saved by works, one cannot be lost by works—or lack of them—either. This question of how faith and works go together requires a biblical definition of faith before the discussion can begin. After these things the word of the LORD came to Abram in a vision: “Fear not, Abram, I am your shield; your reward shall be very great.” But Abram said, “O Lord GOD, what will you give me, for I continue childless, and the heir of my house is Eliezer of Damascus?” And Abram said, “Behold, you have given me no offspring, and a member of my household will be my heir.” And behold, the word of the LORD came to him: “This man shall not be your heir; your very own son shall be your heir.” And he brought him outside and said, “Look toward heaven, and number the stars, if you are able to number them.” Then he said to him, “So shall your offspring be.” And he believed the LORD, and he counted it to him as righteousness (Genesis 15:1-6). Verse 6 is the verse that establishes how all men everywhere are saved: they believe God, and that belief in Him is counted as righteousness. The author of the lesson explains Abraham’s faith as faith that God would bring the promised son, faith that enabled him to give Isaac as an offering, and as believing God could raise him from the dead. What these explanations fail to do, however, is to explain that Abraham’s faith was NOT “believing for” the things God promised. Quite the contrary, Abraham’s faith was submission to Yahweh and believing that God would keep His promises. Abraham’s faith was not a choosing to believe that things would come to pass. Rather, his faith was in the person of Yahweh. He didn’t just believe he’d get a son, or that he could take Isaac up to the mountain because he figured God would raise him. In other words, Abraham’s faith was not focussed on the things God promised; he was not “believing for” miracles. That statement is true, but cannot be made out of context. Abraham trusted God. He believed that God would keep His promises, and even though there was absolutely no evidence—for over a decade—that the promises were forthcoming, nevertheless Abraham believed God. The lesson fails to explain the nature of true faith, the faith of Abraham. Saving faith is not intellectual assent to doctrines or ideas, nor is it a decision to “believe” God. It is trust that submits to God’s word and, at the risk of losing everything one knows and loves, believes that what He says is true. Moreover, true faith has to believe all of God’s word. We can’t pick and choose or rearrange texts to make them say what we believe is true. We have to be willing to set aside our preconceived ideas and believe God as He reveals Himself in His word. Even more important, true faith is not something any person can generate. We don’t DECIDE to believe God because we are naturally UNABLE to believe God. Romans 3:9-18 articulates clearly, quoting from multiple Old Testament passages for emphasis, that no person can do good, can seek for God, can please God, or can do anything that honors God. By nature we are “children of wrath” (Eph. 2:3), and we are utterly unable to believe, to choose God, to do good, or even to seek for God. God has to intervene in our lives in order for us even to respond to Him. For the promise to Abraham and his offspring that he would be heir of the world did not come through the law but through the righteousness of faith. For if it is the adherents of the law who are to be the heirs, faith is null and the promise is void. For the law brings wrath, but where there is no law there is no transgression (Romans 4:13-14). Faith that is counted as righteousness is faith that believes God and is not connected to the law. God’s promise does not come through law, and adherents to the law are not the heirs of salvation. In fact, if we hang onto the law, God’s promise is made void for us, and our faith is null. Adventism will not teach this biblical fact. Abraham believed God before he had done anything to demonstrate his trust and obedience, and God credited him with righteousness because Abraham completely trusted Him and submitted to His will. By faith he went to live in the land of promise, as in a foreign land, living in tents with Isaac and Jacob, heirs with him of the same promise. For he was looking forward to the city that has foundations, whose designer and builder is God. By faith Sarah herself received power to conceive, even when she was past the age, since she considered him faithful who had promised. Therefore from one man, and him as good as dead, were born descendants as many as the stars of heaven and as many as the innumerable grains of sand by the seashore (Hebrews 11:9-12). Abraham did not doubt or waver in his faith when God’s promises failed to be realized in his lifetime. Abraham believed GOD. Abraham’s faith was not a decision to “believe for” a son and a land and a blessing. On the contrary, Abraham’s faith was in God, the Person who was sovereign over him and over all creation. Abraham believed God. When we believe God’s promises to save us and count us righteous, that belief is a gift from Him. We cannot generate that faith. It is not a decision of our will that we exercise. Moreover, our belief is in the truth that He has revealed in Jesus and His finished work. Abraham believed God’s promises; we believe God’s realized promises in Jesus. If we are going to exercise the faith of Abraham, we have to believe what God has revealed in the new covenant. The Lord Jesus came and fulfilled the law, took our sin, and died our death on the cross. He rose from death, and for us to benefit from Jesus’ death, we have to repent and believe that Jesus has completely finished the atonement on our behalf. When we believe, we are transferred out of the domain of darkness into the kingdom of the Beloved Son; we pass from death to life, and we do not come into judgment. There is no ongoing judgment, and there is not future judgment for salvation for those who believe. And they said, “Believe in the Lord Jesus, and you will be saved, you and your household” (Acts 16:30-:31). “For God so loved the world, that he gave his only Son, that whoever believes in him should not perish but have eternal life. For God did not send his Son into the world to condemn the world, but in order that the world might be saved through him. Whoever believes in him is not condemned, but whoever does not believe is condemned already, because he has not believed in the name of the only Son of God (John 3:16-18). This man came to Jesus by night and said to him, “Rabbi, we know that you are a teacher come from God, for no one can do these signs that you do unless God is with him.” Jesus answered him, “Truly, truly, I say to you, unless one is born again he cannot see the kingdom of God.” Nicodemus said to him, “How can a man be born when he is old? Can he enter a second time into his mother's womb and be born?” Jesus answered, “Truly, truly, I say to you, unless one is born of water and the Spirit, he cannot enter the kingdom of God. That which is born of the flesh is flesh, and that which is born of the Spirit is spirit (John 3:2-6). Jesus answered them, “This is the work of God, that you believe in him whom he has sent (John 6:29). And you were dead in the trespasses and sins in which you once walked, following the course of this world, following the prince of the power of the air, the spirit that is now at work in the sons of disobedience—among whom we all once lived in the passions of our flesh, carrying out the desires of the body and the mind, and were by nature children of wrath, like the rest of mankind. But God, being rich in mercy, because of the great love with which he loved us, even when we were dead in our trespasses, made us alive together with Christ—by grace you have been saved—and raised us up with him and seated us with him in the heavenly places in Christ Jesus, so that in the coming ages he might show the immeasurable riches of his grace in kindness toward us in Christ Jesus. For by grace you have been saved through faith. And this is not your own doing; it is the gift of God, not a result of works, so that no one may boast. For we are his workmanship, created in Christ Jesus for good works, which God prepared beforehand, that we should walk in them (Ephesians 2:1-10). The passages above from Ephesians explain how God saves us. We are all born dead in sin. Romans 3 explains that no one seeks God or pleases God. We are by nature children of wrath (Eph. 2:3). We do not drum up the desire to please God or to believe in Him. He has to give us the desire to please Him. He has to give us faith. When we hear the gospel, which is the “power of God to salvation for all who believe” (Rom 1:16), God’s Spirit works through His word to make us recognize our utter sinfulness. He is the One who grants us the understanding of our true condition: spiritually dead, even though our bodies are alive. He is the One who makes the gospel clear to us, and when He awakens us to this reality, that the blood of Jesus has paid for my sin, the atonement is 100% completed on the cross and the curse of sin broken when Jesus rose from death, we realize we must either humble ourselves and submit to the requirements of a holy God or harden our hearts and be our own god. When we realize our sinfulness and repent before the Lord Jesus and His shed blood, God gives us spiritual life and seats us in Christ in heavenly places. This reality is not a metaphor. It is real the moment we trust Jesus, and this is the moment when our Father seals us with His Spirit (Eph. 1:13-14) and transfers us out of the domain of darkness into the kingdom of His Son (Col 1:13). Not only does God bring us to life spiritually (in our real, immaterial spirits which are separate from our physical bodies), but He gives us His work to do (Eph. 2:10). The work we do for God is, quite literally, the work He puts in front of us. He does not wait for us to think of altruistic and pious deeds to do; He brings us His assignments. This fact does not make sense to people who are not made alive in the Spirit by being born again. Good works are the work of God which he designs for us and gives us, and these works are NOT works of the law. In other words, keeping Sabbath and not eating or drinking certain things are not the works of God. In fact, these works will not prove we have faith. Romans and Galatians are extremely clear that returning to works of the law severs us from Christ and we fall from grace (Gal. 5:4). We don’t have to worry about doing good works when we are born again. Our new Father brings us His work to do, and by His Spirit in us convicts us and leads us to do the next right thing. God doesn’t reveal a five-year plan to us; He shows us one step at a time. 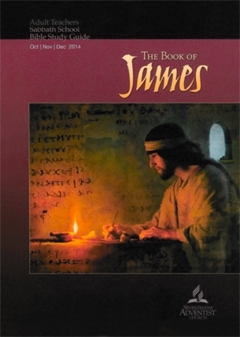 The commands in James were reminders to new Jewish believers to trust God and to realize that if they were truly born again, their lives would reflect that fact. James was not telling them to do good works so as to demonstrate their faith; he was telling them that if they had no good works, it was questionable whether or not they had saving faith. The work of God is to believe the One He sent, and to submit to Him moment by moment, thanking Him for all things and willingly walking where He shows us our next step should be. Copyright 2014 BibleStudiesForAdventists.com. All rights reserved. Revised November 7, 2014. This website is published by Life Assurance Ministries, Camp Verde, Arizona, USA, the publisher of Proclamation! Magazine. Contact email: BibleStudiesForAdventists@gmail.com.